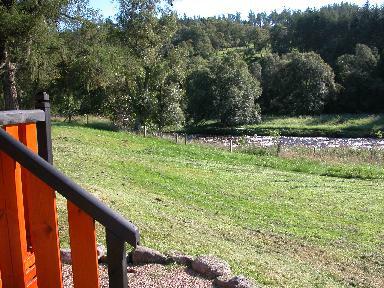 Welcome to Larch Cottage, our self-catering chalet in beautiful Glenisla, the most westerly of the Angus Glens. Our chalet is a single luxury pine bungalow built beside the River Isla, near the small village of Kirkton of Glenisla, approximately 10 miles from Alyth. Built in 2004, the chalet is furnished to a high standard and has fitted carpets and electric heaters in all rooms, and a log-burning stove in the sitting area. The sloping ceilings, large windows, and southern exposure make the chalet very light and spacious. In Spring 2013, the Cateran Trail GeoTour was launched. A GeoTour is a series of geocaches with a common topic or theme and defined locations, and this will be the first official one in the UK. See Cateran Trail GeoTour! From Edinburgh it takes about and hour and forty-five minutes to reach the chalet. 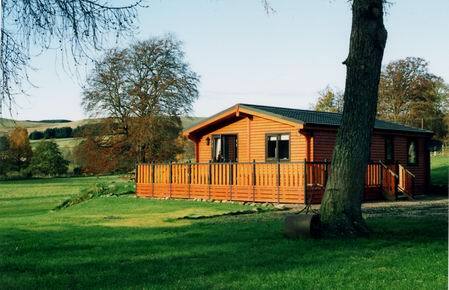 Situated approximately 35 miles from both Perth and Dundee, it is just 10 miles from the Cairngorms National Park. Glenisla is one of the prettiest of the Angus Glens, and is a great centre for numerous outdoor activities, including cycling, hillwalking and fishing, and for exploring further afield in Angus and Perthshire.